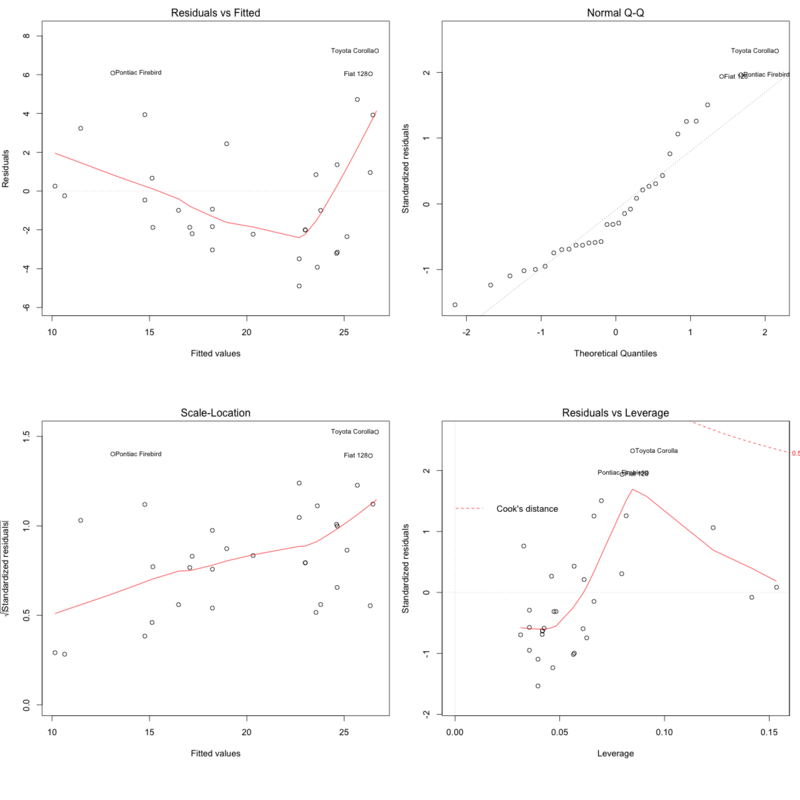 Building a linear regression model is only half of the work. 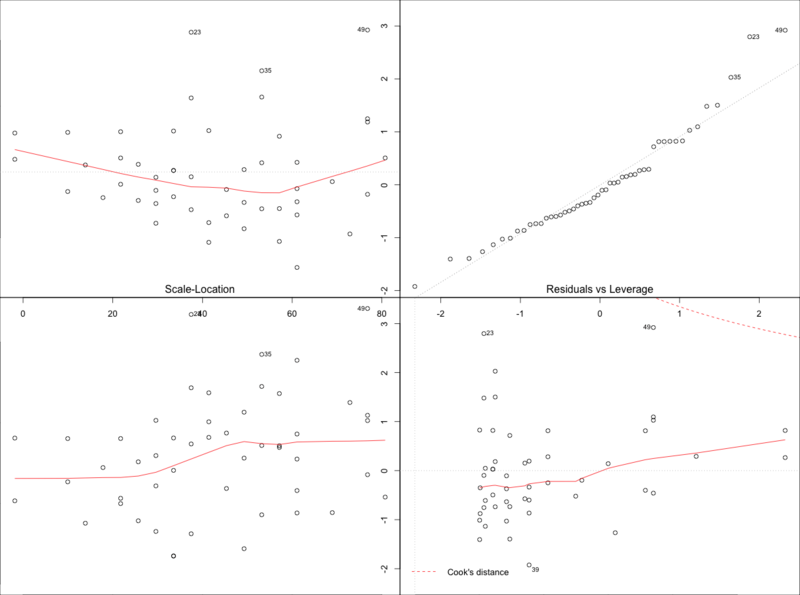 In order to actually be usable in practice, the model should conform to the assumptions of linear regression. Though, the X2 is raised to power 2, the equation is still linear in beta parameters. So the assumption is satisfied in this case. Check the mean of the residuals. If it zero (or very close), then this assumption is held true for that model. This is default unless you explicitly make amends, such as setting the intercept term to zero. Since the mean of residuals is approximately zero, this assumption holds true for this model. 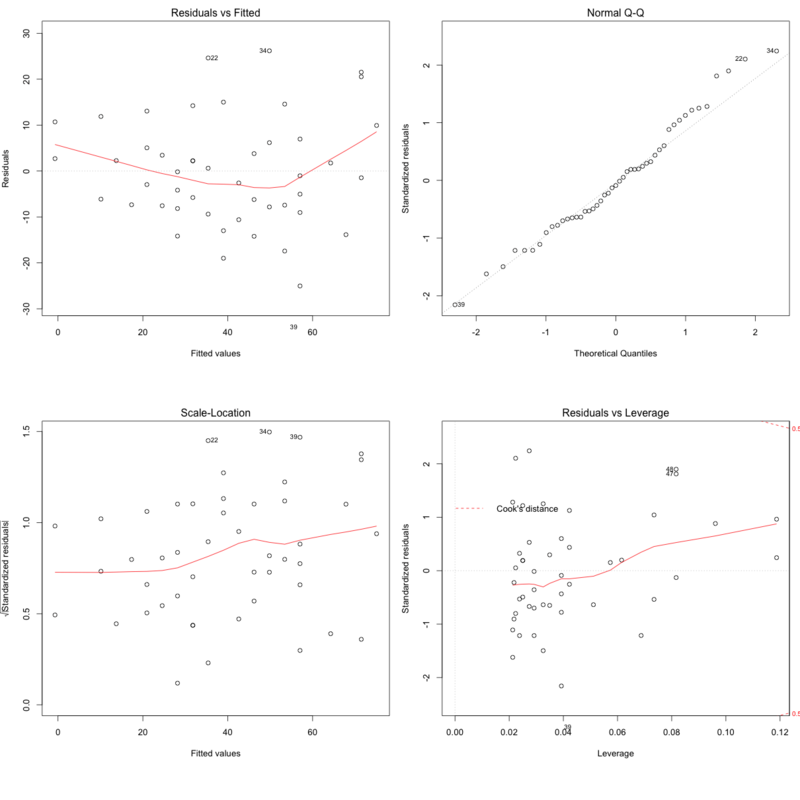 Once the regression model is built, set par(mfrow=c(2, 2)), then, plot the model using plot(lm.mod). This produces four plots. The top-left and bottom-left plots shows how the residuals vary as the fitted values increase. 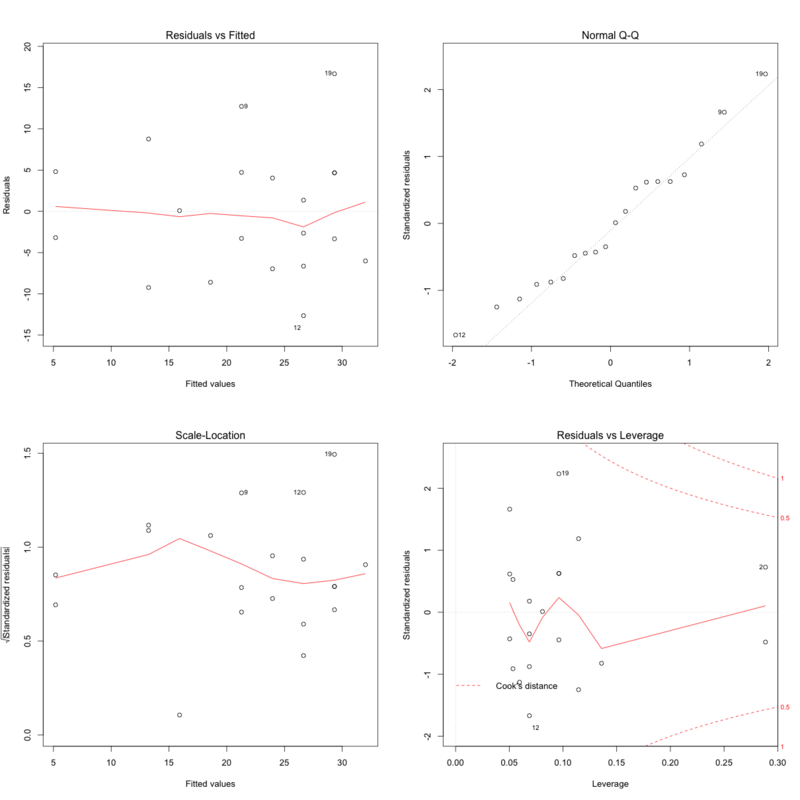 From the first plot (top-left), as the fitted values along x increase, the residuals decrease and then increase. This pattern is indicated by the red line, which should be approximately flat if the disturbances are homoscedastic. The plot on the bottom left also checks this, and is more convenient as the disturbance term in Y axis is standardized. In this case, there is a definite pattern noticed. So, there is heteroscedasticity. Lets check this on a different model. Now, the points appear random and the line looks pretty flat, with no increasing or decreasing trend. So, the condition of homoscedasticity can be accepted. This is applicable especially for time series data. Autocorrelation is the correlation of a time Series with lags of itself. 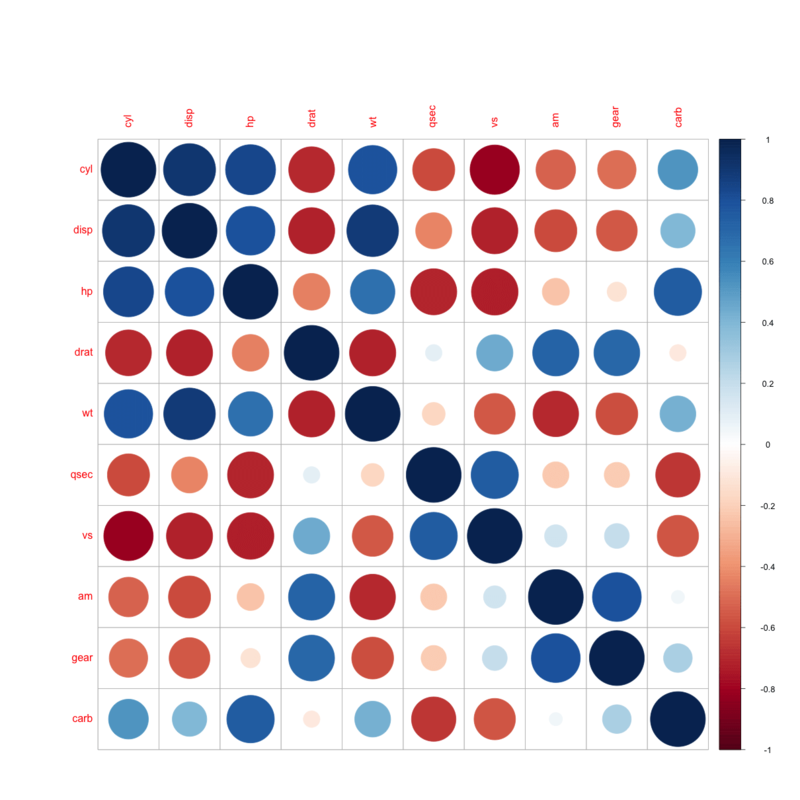 When the residuals are autocorrelated, it means that the current value is dependent of the previous (historic) values and that there is a definite unexplained pattern in the Y variable that shows up in the disturbances. How to check for autocorrelation? Below, are 3 ways you could check for autocorrelation of residuals. acf(lmMod$residuals)  # highly autocorrelated from the picture. The X axis corresponds to the lags of the residual, increasing in steps of 1. The very first line (to the left) shows the correlation of residual with itself (Lag0), therefore, it will always be equal to 1. If the residuals were not autocorrelated, the correlation (Y-axis) from the immediate next line onwards will drop to a near zero value below the dashed blue line (significance level). Clearly, this is not the case here. So we can conclude that the residuals are autocorrelated. With a p-value < 2.2e-16, we reject the null hypothesis that it is random. This means there is a definite pattern in the residuals. So, dwtest also confirms our finding. Add lag1 of residual as an X variable to the original model. This can be conveniently done using the slide function in DataCombine package. Lets check if the problem of autocorrelation of residuals is taken care of using this method. 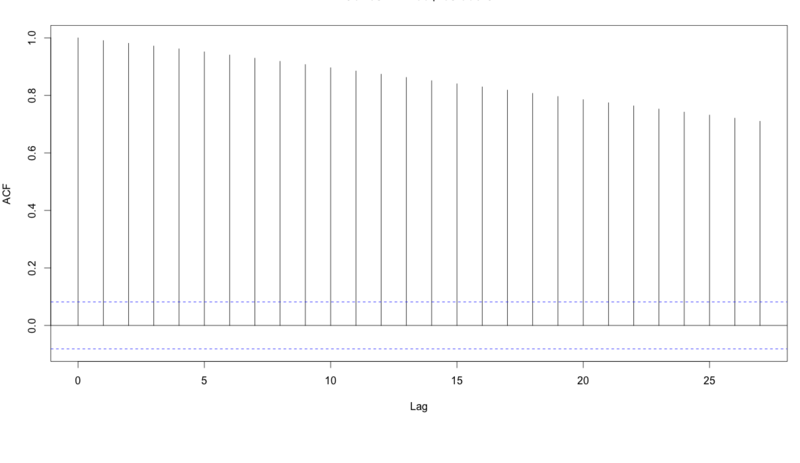 Unlike the acf plot of lmMod, the correlation values drop below the dashed blue line from lag1 itself. So autocorrelation can’t be confirmed. p-value = 0.3362. Can’t reject null hypothesis that it is random. With a p-value = 0.3362, we cannot reject the null hypothesis. Therefore we can safely assume that residuals are not autocorrelated. With a high p value of 0.667, we cannot reject the null hypothesis that true autocorrelation is zero. So the assumption that residuals should not be autocorrelated is satisfied by this model. If, even after adding lag1 as an X variable, does not satisfy the assumption of autocorrelation of residuals, you might want to try adding lag2, or be creative in making meaningful derived explanatory variables or interaction terms. This is more like art than an algorithm. Do a correlation test on the X variable and the residuals. p-value is high, so null hypothesis that true correlation is 0 can’t be rejected. So, the assumption holds true for this model. This can be directly observed by looking at the data. This means the X values in a given sample must not all be the same (or even nearly the same). The variance in the X variable above is much larger than 0. So, this assumption is satisfied. There is no perfect linear relationship between explanatory variables. Using Variance Inflation factor (VIF). But, What is VIF? where, Rsq is the Rsq term for the model with given X as response against all other Xs that went into the model as predictors. Practically, if two of the X′s have high correlation, they will likely have high VIFs. Generally, VIF for an X variable should be less than 4 in order to be accepted as not causing multi-collinearity. The cutoff is kept as low as 2, if you want to be strict about your X variables. See correlation between all variables and keep only one of all highly correlated pairs. #=> Interpreted from below plot. The convention is, the VIF should not go more than 4 for any of the X variables. That means we are not letting the RSq of any of the Xs (the model that was built with that X as a response variable and the remaining Xs are predictors) to go more than 75%. => 1/(1-0.75) => 1/0.25 => 4. The residuals should be normally distributed. If the maximum likelihood method (not OLS) is used to compute the estimates, this also implies the Y and the Xs are also normally distributed. 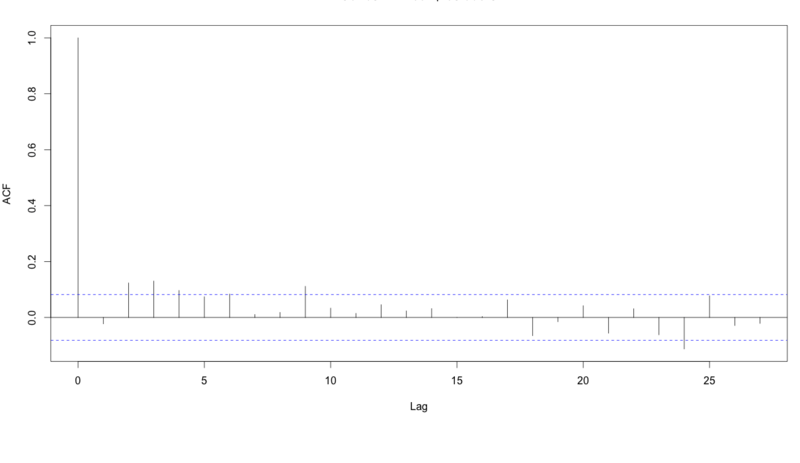 This can be visually checked using the qqnorm() plot (top right plot). The qqnorm() plot in top-right evaluates this assumption. If points lie exactly on the line, it is perfectly normal distribution. However, some deviation is to be expected, particularly near the ends (note the upper right), but the deviations should be small, even lesser that they are here. The gvlma() function from gvlma offers a way to check the important assumptions on a given linear model. #=> Global Stat        15.801 0.003298 Assumptions NOT satisfied! #=> Skewness            6.528 0.010621 Assumptions NOT satisfied! #=> Kurtosis            1.661 0.197449    Assumptions acceptable. #=> Link Function       2.329 0.126998    Assumptions acceptable. #=> Heteroscedasticity  5.283 0.021530 Assumptions NOT satisfied! Three of the assumptions are not satisfied. This is probably because we have only 50 data points in the data and having even 2 or 3 outliers can impact the quality of the model. So the immediate approach to address this is to remove those outliers and re-build the model. Take a look at the diagnostic plot below to arrive at your own conclusion. From the above plot the data points: 23, 35 and 49 are marked as outliers. Lets remove them from the data and re-build the model. #=> Global Stat        7.5910 0.10776 Assumptions acceptable. #=> Skewness           0.8129 0.36725 Assumptions acceptable. #=> Kurtosis           0.2210 0.63831 Assumptions acceptable. #=> Link Function      3.2239 0.07257 Assumptions acceptable. #=> Heteroscedasticity 3.3332 0.06789 Assumptions acceptable. Though the changes look minor, it is more closer to conforming with the assumptions. There is one more thing left to be explained. That is, the plot in the bottom right. It is the plot of standardized residuals against the leverage. 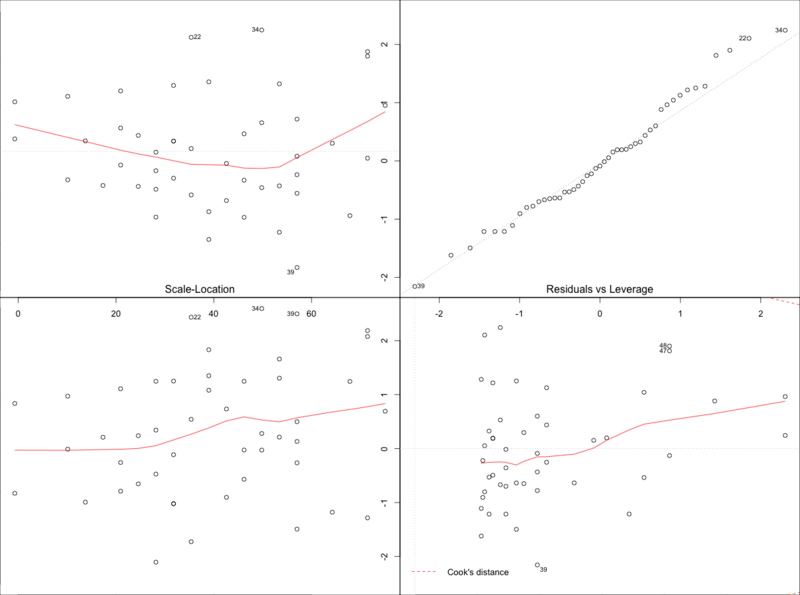 Leverage is a measure of how much each data point influences the regression. The plot also contours values of Cook’s distance, which reflects how much the fitted values would change if a point was deleted.